It's time once again. It's time for the Men-In-Black to start hammering on your front door. It's time for secret government operatives to start tapping your phone and email accounts. It's time for those pesky little grey aliens to start abducting you from your bedroom at night. 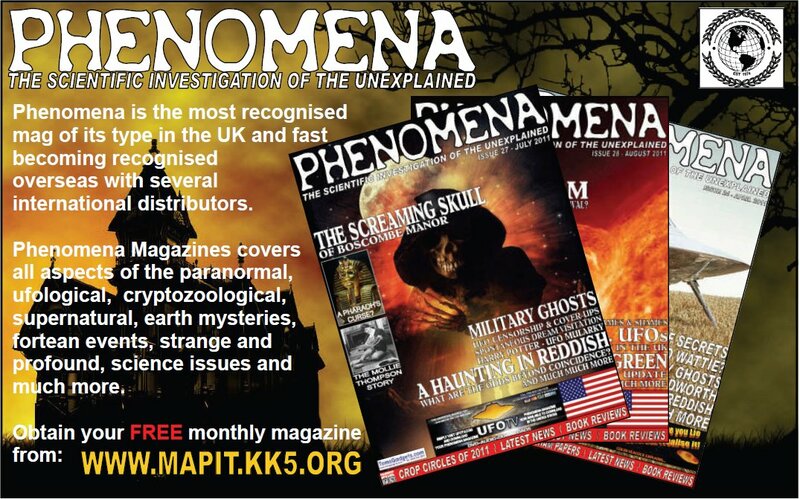 It's time for all of this because your number one weekly newsletter of conspiracies, UFOs, the paranormal and everything strange and bizarre has once again arrived in your email box - and they want to read it to find out what is REALLY going on. YOU WILL BELIEVE A MONGOOSE CAN TALK! What Was The "Dalby Spook"- Poltergeist - Familiar - House Spirit - Or An Extra-Special Little Mongoose? GEF THE TALKING MONGOOSE HAS BEEN DESCRIBED AS THE EIGHTH WONDER OF THE WORLD. He mimicked other animals and sounds. He was able to move objects through the air although he was no where near them. He chatted with visitors from around the world, sometimes using vulgar language.But they could not see him, because he said he could become invisible whenever he wanted to. All the time living in the walls of a remote farmhouse located on the windswept coast of the Isle of Man. To the Irvings, especially their teenage daughter, Gef was not a frightening creature but the family’s pet who could feast on biscuits, chocolate and bananas, and helped them keep the stoves lit. But to others he was considered a “monstrosity,” a freak of nature, an abomination to God. In addition to original material, included is the full text of the 1936 book by psychic researcher Harry Price. Exceedingly rare, copies have been selling for upward of $1,000 among collectors. For here are other strange stories – such as the talking stove, the Squonk, and the Bell Witch, as presented by Tim R. Swartz and today’s leading investigators of the strange and unknown. This is one of the top Fortean stories of all time. An occult masterpiece. An adventure into the unknown, and the supernormal. 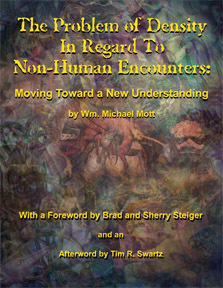 This fascinating book is now available to readers of Conspiracy Journal for the special price of $18 (Plus $5 Shipping). Dana Negrey jokes he's determined to enjoy a moment of peace before he dies. One that is free of the low-frequency rumble bombarding his eardrums 24 hours a day, seven days a week, and void of the whirling fans, sleep headphones and other types of white noise he uses to drown out the mysterious hum he first discovered in 2008 when living in the northwest Calgary community of Ranchlands. He even continues to be hounded by the sound at his home in Edmonton, where he has lived since 2012. Negrey said he's often asked what it sounds like by people who can't hear the hum, sometimes while they are standing right next to him. "It sounds like a locomotive diesel engine idling in the distance … sometimes it's so loud it actually will drive me out of the house or room that I'm in," said Negrey. CBC News first spoke to Negrey back in 2009 when he and others tried to uncover the source of the Ranchlands hum. But despite recordings done in the neighbourhood, nearby construction sites, a C-Train power station, and even a rail yard, nothing matched the 40-hertz tone being picked up by audio recordings in Negrey's and others' homes in the community. And after a few years, the search kind of petered out, until Negrey moved to Edmonton in 2012. "I thought, 'oh for goodness sakes, here we go again.'" Negrey started digging into the hum phenomenon 10 years ago when he first noticed it in Calgary. He worked with the local community association, an acoustic engineer and a noise expert. Together they would analyze recordings in order to try to pinpoint a source. One of the homes they investigated was Terry Avramenko's. "The other day I was in the basement just standing there and all of a sudden I went, 'oh yeah there is the noise.' So for myself I can hear it but also because the frequency is so low you actually feel it," said Avramenko, who describes it as an idling transport truck. He recalls once trekking through the neighbourhood with Negrey, following the source of the hum until at one point it just dropped off. He and his wife have just come to accept the noise, although they would like to know what's causing it. In 2012, the investigation into the Ranchlands hum trailed off when Negrey got a job in Edmonton. He said when he packed up his family and left, he believed he'd be leaving the hum behind. But he said it didn't take long before his ears picked up a similar disturbance in his new home. "And that's when my suspicions popped up … I'm convinced this is far beyond what Ranchlands is experiencing." Negrey said he's heard the same low-frequency hum in Lethbridge and St. Paul, Alta. The only place he hasn't heard it is at the top of the Bald Hills Trail in Jasper National Park. His wife doesn't hear it but feels the hum's vibrations. And they've both noticed the mysterious phenomenon intensifying over time. "When we were in Calgary every so often she'd say 'I'm feeling a bit of a vibration' and I'd say 'isn't that something, cause I'm hearing the hum really loudly,' whereas here she will sit down at the dining room table and she'll say 'my goodness I can't even sit here. The vibration is so bad.'" Negrey said some people hear it, and some people don't. But he said he feels better knowing the hum has been recorded by an acoustic engineer in both of his homes. Here's a sample of the hum taken in Ranchlands. Negrey said the samples rule out an inner-ear issue, or, as some have suggested, that it's all in his head. And for whatever reason, whether it's environmental damage, age or genetics, he said he is more sensitive to low-frequency sounds. "I'm very much like a human divining rod, whether it's a blessing or a curse, I don't know." Negrey and acoustic engineer Richard Patching say they have no idea what's causing the hum, or possibly hums, nor whether it's being caused by one thing or a combination of things. "We're kind of grabbing at straws here," said Patching. One of those straws involves the construction of a Faraday cage. It's an enclosure that blocks out electromagnetic radiation, such as radiowaves, Wi-Fi and cellular signals, and static electricity. The idea is if Negrey can still hear the hum when he's inside the cage, then that would rule out those sources. And if it blocked out the hum, then it could also be used as a preventative tool. Negrey wanted his steel box to be cost effective and portable so he built his Faraday cage out of wood. He then wrapped it in chicken wire. It is about three feet wide by two feet long and four feet high. He then had to find a way to ground it. Negrey said he was nervous to test it out. But eventually he did, while it was in his garage. "And then I said, 'Richard are are we sure that this Faraday cage works?'" Negrey and Patching say before they rule out anything they want to make sure they have built a proper cage. Negrey also put in a battery-operated radio to see if it would work. And it did. He said that means the cage is letting in radiowaves. So they are now doing further testing on the Faraday cage. They are thinking of swapping out the chicken wire for better aluminum wire. The problem with their investigation, they say, is that it's part-time and voluntary so any real progress is taking longer than they'd like. But over time they've developed some hypotheses. Negrey believes it's man-made, either mechanical or electrical, and came online in Alberta in 2008. He also believes it's a combination of energy sources or noises that's creating the hum. "Whatever it is it's definitely increasing in scope and definitely continuing to be frustrating to deal with," said Negrey. In the meantime they don't want to rule out any good ideas, but Patching said some of the ones people have sent him are out there, including solar flares hitting the Great Pyramids in Egypt and police surveillance satellites hovering over their house. Patching said, for one, satellites don't hover. Negrey said he too isn't open to fantastical explanations. "Like people saying it's aliens or some sort of thing like that, that's absurd." Once their cage is properly built and tested they plan to take it to different locations throughout Alberta to see whether the hums Negrey hears elsewhere are similar. They also plan to eventually offer to test the homes of others bothered by a hum so they can generate a bigger map to help pinpoint a potential source, or sources. And then, maybe then they could find a way to shield themselves from it, or stop it altogether. "I cannot continue to live a life … having to deal with a hum that somehow has appeared because somebody has installed something somewhere and if I'm any indication, and the responses we've had, it's affecting a number of Canadians." If there were such a thing as a top ten list of unexplainable phenomena throughout history, Gef would rank right at the top. Fortean researchers, parapsychologists and skeptics alike would have to admit that they have never encountered such a bizarre but apparently well-documented case that is so completely devoid of hysteria in the timeless annals of the unexplained. If Gef the talking mongoose is what it is claimed he is, he should certainly turn the heads of the scientific community, who at first glance would probably consider this to be a case of mass hysteria. ** Mimic the sounds of other animals. ** Move objects through the air although he was nowhere near them. ** Chat with visitors from around the world, sometimes using vulgar language. ** Hide himself from curious eyes and become invisible whenever he wanted to. Whatever the powers that lurk behind the curtain of paranormal mystery truly are, they usually manifest in dark and frightening ways. They are not shy or apologetic about inducing extreme levels of terror in the hapless percipients who encounter them. But in the case of Gef, the Talking Mongoose, it seems as though the spirits are having a bit of childlike fun, indulging in a whimsical playfulness where no one is really injured or frightened – just perplexed and made curious by a creature who crossed over from the other side and took up residence in the home of a farming family living on the Isle of Man, located in the Irish Sea between Great Britain and Ireland. Publisher Timothy Green Beckley has done his readers a favor by resurrecting an out-of-print book about Gef that is not only extremely rare but very costly. The book is called “The Haunting of Cashen’s Gap: A Modern ‘Miracle,’” by Harry Price and R.S. Lambert, and was first published in 1936. Original copies sell for up to $1000 nowadays, but Beckley can provide not only the original text but the updated research of present-day writers like Tim R. Swartz and Hercules Invictus for the price of an everyday paperback. 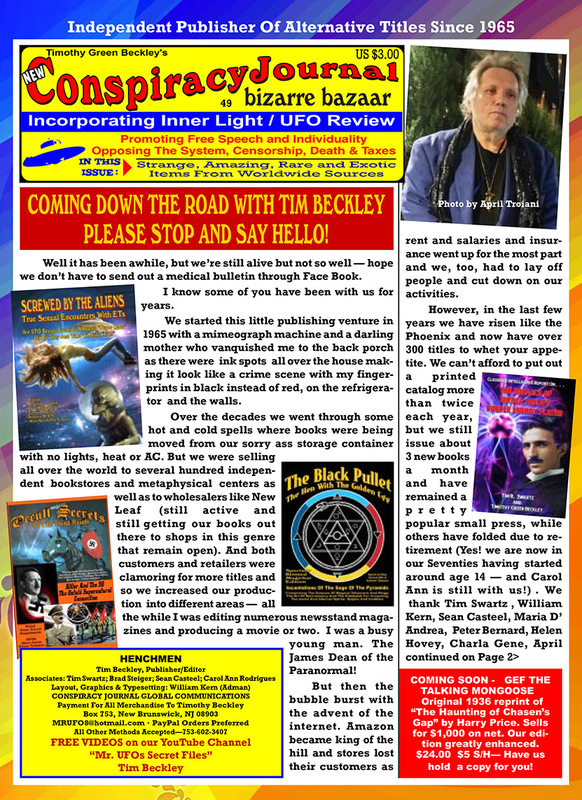 Beckley’s updated reprint is called, simply enough, “Gef The Talking Mongoose,” and opens with a chapter by longtime paranormal researcher Tim R. Swartz. Swartz provides an excellent overview of the Gef saga and equips the reader with the basic facts as a precursor to the more detailed treatment by Price and Lambert. Gef made his first appearance on September 13, 1931. Thinking the sounds were caused by rats or other pests, the family set traps but caught nothing. Jim made a last-ditch attempt by growling like a dog at the invasive vermin, only to hear something growl right back. He then realized it was the animal he’d seen outside. Voirrey, the family’s young child, was fascinated by the new guest and would ask the creature to repeat nursery rhymes, which it would do in a clear, high-pitched voice. The family called the interloper “Jack,” but he soon told his hosts he preferred to be known as “Gef,” spelled G-E-F. He claimed to have been born in Delhi, India, in 1852, and he was brought to the island twenty years earlier when a farmer had imported mongooses to the area hoping to curb the local rabbit population. Gef said he had always understood human speech, but he learned to speak himself more recently, having been taught by Jim. As rumors of the strange creature spread throughout the Isle of Man, it was often claimed that Voirrey was fooling everyone by “throwing her voice,” an explanation that Swartz skillfully debunks. Investigators speculated from the beginning that Gef was a haunting of some kind – possibly a poltergeist. The case attracted attention from the media. News of the mystery first reached London in October 1931, when an item concerning a “man-weasel” appeared in the press. A newspaper called the Daily Sketch published a photo of the Irving cottage with the caption “The Talking Weasel Farm,” and the Daily Mail and other journals briefly reported strange events at Doarlish Cashen. The northern newspapers took a larger and more sustained interest in the affair because the talking animal was a near neighbor and naturally paid more attention than the London newspapers. Early in 1932, the Manchester Daily Dispatch sent a reporter to the Irving farm in order to investigate the mystery at its actual location. He was fortunate enough to hear Gef speak. Jim Irving told the reporter the story of how the animal had taken up residence in the family home but denied that the place was haunted. “There are no spooks here,” Irving declared. WHO OR WHAT WAS GEF? 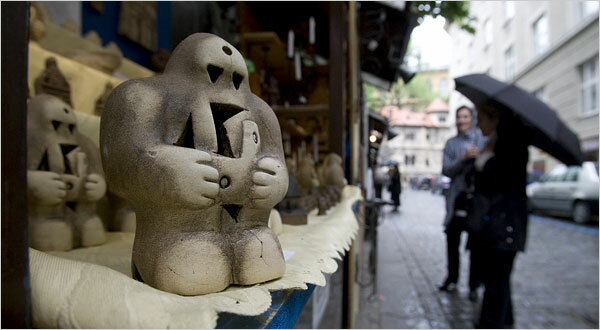 The publicity in various media outlets quickly piqued the curiosity of psychic investigators Harry Price and R.S. Lambert, who would team up to write the aforementioned paranormal classic “The Haunting of Cashen’s Gap,” based largely on their own onsite investigation of the Irvings and their mysterious houseguest. In their introduction, the pair writes: “The following pages are an essay in the Veracious but Unaccountable. Whether looked at from the point of view of psychology, of psychical research, of anthropology or of sociology, this true story of Gef is very odd. We have been moved to set it down in as full a form as possible in order that everyone interested – including, we hope, posterity – may be in a position to form their own judgment about it. And what does Gef call himself? He cannot be relied on, the two investigators write, to tell his hosts exactly what he is. At various times he has called himself a mongoose and an “earthbound spirit.” This last description, they write, is a “purely spiritualistic term,” adding that Gef is thought to be afraid of dying, so he cannot be assumed to have made the transition to the world of the dead. The Irving’s did not see Gef as a frightening creature but more like the family’s pet, one who could feast on biscuits, chocolate and bananas and helped them keep the stoves lit. But to others he was considered a “monstrosity,” a freak of nature, an abomination to God. Gef suddenly took to singing and speaking in strange tongues. The authors were told that “the voice is extremely high-pitched, above the human range, with a clear, sweet tone.” He began to sing more and more: songs, hymns and ballads. Some of these the Irvings knew, some were new to them. His singing became almost a nuisance. That last remark about a pillar of salt led the researchers to speculate that Gef must have attended Sunday school somewhere. Gef also found enough amusement in his living situation to make the Irvings familiar with the sound of his laughter. Price and Lambert can only offer three possibilities as to ultimate reality of Gef. First, Gef exists and haunts Doarlish Cashen, substantially as the Irvings say he does. Two, that Gef is a product of hallucination and fantasy. Or three, that Gef is a product of conscious deception. Acceptance of the first conclusion rules out the other two, but the second and third conclusion are not exclusive of each other and may be entertained together or separately. In assessing the reality of Gef, the authors are unwilling to sweep away the many trustworthy outside witnesses who heard Gef and were certain of his independent existence. They take very seriously the findings of people who also visited the farm, such as spiritualists, teachers, hikers, relations and neighbors, and are unwilling to discount their statements. Given the reality of Gef, the authors speculated that had he been rather more docile and agreeable in his behavior, less elusive in his manifestations, and more pleasing in his personality, he might have become in time the center of a sort of cult. In spite of his deficiencies, he gained a circle of admirers eager to hear his latest doings, ready to pay periodic visits to his shrine, and to bring small gifts to win his good will. But what a fascinating voice! 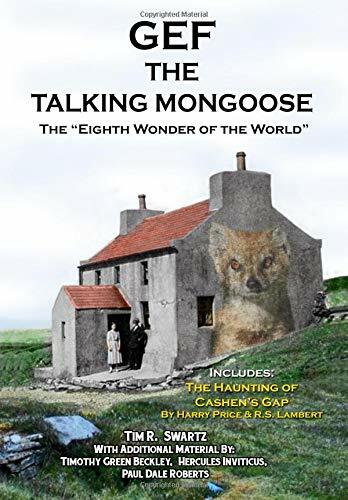 Whether it came from a “clever” mongoose or a poltergeist in animal form, reading “Gef The Talking Mongoose” will more than satisfy occultists and students of the supernatural like few other works available today. This priceless reprint of 1936’s “The Haunting of Cashen’s Gap” coupled with the 21st century efforts of Beckley and his pool of writers is a must-have item for both collectors and newcomers to the subject. Oh, and by the way, there is even an account in the book of a talking stove – yes, I said talking stove – that goes well beyond the boundaries of Gef’s abilities as an animal to speak. The universe gets stranger all the time. Where are John Keel and Charles Fort when you need them the most? For those who assert there is such a thing as genuine poltergeist activity (as opposed to the skeptics who attribute it all to natural phenomena, over-imagination or hoaxes) the question becomes: "What is a poltergeist, anyway?" Believers fall into, roughly speaking, two different camps: some posit that polts are independent spirit beings--ghosts with a taste for nasty practical jokes. Others are of the opinion that what we are dealing with are manifestations unwittingly created by the troubled emotions of some member of the affected household--usually a child or teenager. That debate will likely never be solved on this side of the grave. However, famed ghost researcher Harry Price recorded one English "poltergeist" case which strongly suggests that these "spirits" or "demons" are evidence of the awesome and little-understood power of our subconscious minds. The story centers around the family of a Sutherland doctor named Wilkins. In 1940, Wilkins' 19-year-old daughter Olive became engaged to a young flight lieutenant in the RAF. Her parents were not in favor of the match. Although they had nothing against her beau, Dr. and Mrs. Wilkins felt Olive was too young for marriage. Even more seriously, the current war meant that odds were good their daughter might soon go from bride to widow. In the end, however, the course of true love ran smoothly and the young couple married in the fall of 1941. The newlyweds settled in a rented flat near the Wilkins home, and Olive found work as a secretary. When her lieutenant was on duty, Olive spent much of her time with her parents. She had left many of her belongings in her old bedroom, so the Wilkinses must have often felt like Olive had never left home at all. On February 26, 1942, Mrs. Wilkins borrowed a pin from her daughter's room. After being out for the day, Mrs. Wilkins came home and went back to Olive's room to return the pin. She was stunned to find the bedspread carefully turned down. She had not touched the bed all day, and she knew no one else had been in the house. Three days later, Mrs. Wilkins was in the kitchen. She heard the front door open, followed by the unmistakable sound of Dr. Wilkins's footsteps, along with the clicking of her daughter's high heels. She was surprised to see only her husband enter the room. "Where is Olive?" she asked. "I don't know," he replied. Dr. Wilkins had come in alone, and had not heard the second pair of footsteps. Four days after this, Mrs. Wilkins noticed that Olive's bed was mussed up, as if someone had been sleeping in it. A short time later, one of Olive's books had mysteriously been taken from the bookcase and left open on the windowsill. A week later, Mrs. Wilkins again heard the front door opening, followed by footsteps in the hallway. This time, she heard only one set of footsteps: Olive's. The steps went upstairs, and into Olive's room. Then, the steps went into the bathroom, where after a moment, Mrs. Wilkins heard the toilet flush. Then, there was silence. Mrs. Wilkins went upstairs, only to find no one there. When Dr. Wilkins came home, his wife told him her strange story. He went over to Olive's flat. She stated that she had not been to her parents' house all day. The next few weeks saw two important events: Olive announced that she was pregnant, and her husband was posted overseas. As Olive's pregnancy advanced, so did the weird paranormal activity in her old home. Olive's former bed would not stay fixed. Mrs. Wilkins was constantly finding the bedclothes rumpled, or folded neatly down, or stripped from the bed altogether. Olive's dresser drawers were frequently found open, with the contents placed on the bed. It was now a regular event for Mrs. Wilkins to hear what she swore were the sounds of Olive opening the front door and walking up the stairs and into her old bedroom. When Mrs. Wilkins would go investigate, the footsteps immediately stopped. One day, Mrs. Wilkins arrived home to find that a photograph of Olive that was normally kept on the dining room mantelpiece had been placed on the table. Mrs. Wilkins, fearing this was some sort of bad omen, immediately called her daughter's workplace. She was told that Olive had unexpectedly gone into labor, and had been taken to the hospital. Happily, Olive was safely delivered of a healthy girl, whom she named Enid. The baby's arrival simultaneously marked the end of the paranormal activity that had plagued the Wilkins home. The "poltergeist"--or whatever one cares to call it--was gone for good. There was an obvious link between the Fortean events and Olive's marriage and pregnancy, but what did it all mean? Did Mrs. Wilkins' natural anxiety about her daughter, and desire to have her back home, cause her subconscious to create a "phantom Olive" who never married and left the family nest? Or were they manifested by Olive herself? Forced to deal with the combined stress of a husband in active service and her first pregnancy, did she secretly long for her more carefree unmarried life? The Wilkins case is a perfect illustration of how "poltergeist activity" is virtually impossible to categorize, let alone understand. Whitley Strieber’s 1987 best-selling book, Communion, brought the world of alien abductions to a massive, mainstream audience. During the course of investigating his experiences that prompted him to write Communion, Strieber discovered something intriguing: that the name “Aura Rhanes” – an alleged human-like alien encountered by a man named Truman Bethurum in 1952 – was extremely similar to “Aerach Reann,” a Gaelic term that translates approximately to “heavenly body of air.” It must be said that the fashion by which Bethurum became entranced by Aura Rhanes (“tops in shapeliness and beauty” was how smitten Bethurum described her) mirrors those centuries-old cases of hapless and helpless men falling under the spell of the fairy queen. Strieber pursued this Gaelic issue. Then there are the experiences of a young man named Bob Renaud. 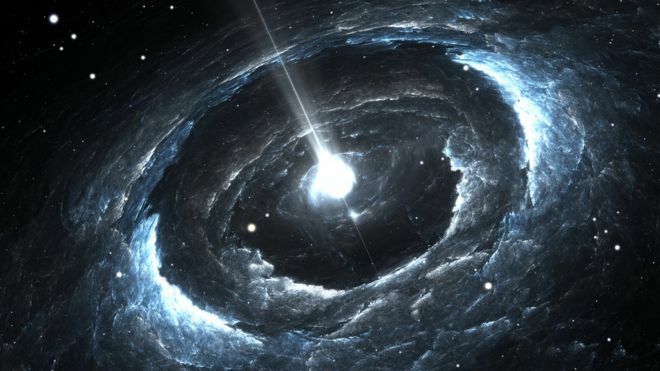 On one particular night in July 1961, Renaud picked up an extraordinary message while “browsing around the shortwave bands” in his small, Massachusetts town. It began with a series of bleeps but was soon replaced by a female voice, which later identified herself as Linn-Erri from the planet Korendor. As was the case in so many Contactee-themed cases of the 1950s and 1960s, Renaud had repeated and extensive chats with his newfound alien friends, many of which were focused on the aliens’ fears that we, the Human Race, were on the verge of destroying ourselves. Also closely following the trend of so many Contactees, Linn-Erri and her comrades took Renaud on trips to secret, alien installations, and taught him to create complex machines, one of which was somewhat akin to an old-style television set. It reportedly allowed Renaud to see Linn-Erri in the flesh, so to speak. She was, said Renaud, a ravishing blond, who looked to be about nineteen years of age, but who claimed to be closer to her mid-seventies – in human years. Coincidence or something more? A UFO-Gaelic Connection? Even the first lady, Michelle Obama once paid her respects when she visited Rabbi Loew’s grave and, following Jewish tradition, placed a prayer on a piece of paper and put it near his tombstone.